Using rivoli connector glue in one round stone art. 1122 12mm from the Swarovski crystal assortment. Repeat for pair and set aside to dry. Slip onto one silver headpin: one Swarovski bead art. 5601 4mm, one sew-on stone art. 3700 10mm, one sew-on stone art. 3700 8mm, one sew-on stone art. 3700 6mm, one bead art. 5328 3mm. Turn a simple loop or wire wrap closed. Repeat Steps 2-3 times 3 and set aside. Slip onto one silver headpin: one bead art. 5601 4mm, one sew-on stone art. 3700 12mm, one sew-on stone art.3700 10mm, one sew-on stone art. 3700 8mm, one sew-on stone art. 3700 6mm, one bead art. 5328 4mm. Repeat Steps 5-6 one more time and set aside. Using rivoli connector open an oval jumpring and attach the small tree component to the an outside loop on the connector. Repeat for opposite outside loop on connector. Open remaining jumprings. Link 4 jumprings to center loop on connector. Open last jumpring and attach large tree. 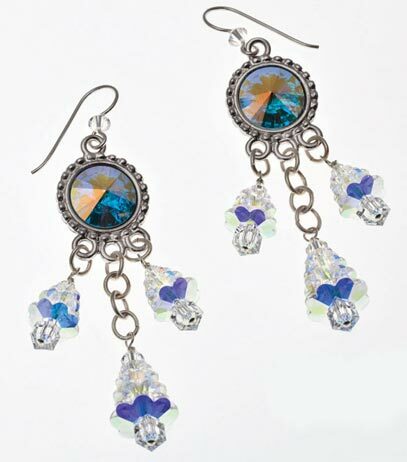 Using the add-a-bead earwire, load on one Swarovski bead art. 5328 4mm crystal AB. Turn a simple loop on the earwire. Open up the loop and attach to the top hole of the rivoli connector. Repeat Steps 8-10 to make second earring.